That exciting time of year is quickly approaching, the one when you can shut off those early morning alarm clocks, take a break from packing lunches, practicing spelling words, running out the door with barely a minute to spare. You daydream of lazy days by the pool with the kids.Well, until the fighting and whining starts and then you find yourself counting down the days until the first day of the new school year. But, we'll save that conversation for another time! If you are anything like me, I'm barely keeping my head above water the last few weeks of school. The alarm clock goes off about twenty minutes later than it did at the beginning of school, I find myself forgetting to pack their snack or sign the reading log and I simply cannot believe another school year is almost over! I also fight back tears because it feels like just yesterday we were taking preschool pictures and now they look like grown boys who will be starting another grade level. Something that once seemed so far away, is now reality. Before they grow into typical teenagers who would rather spend their time with friends and (gulp) girls instead of snuggling with me on the couch reading books and talking about Mine craft, or happily spending weekends together as a family where one of my guys always gives me a hug and announces "I love my family!" I am trying to cherish every moment, celebrate their hard work in school, and have a little fun. Welcome to Summer kids!! The last few years I have hosted an easy get together celebrating the end of school with lots of water play and fun! Click here to see the first Welcome to Summer Party. This past year the twins each invited three boys from their class to our Welcome to Summer bash. We planned this party for the last day of school and had lots of messy fun! Our second Costco purchased giant ball, sadly this one didn't survive too long after the party either but it provided a whole lot of fun while it lasted. I had the yard set up with the inflatable pool, homemade slip n slide complete with Dawn dish soap for extra speed, squirt gun station, messy Twister, and a friendly challenge course between the two classrooms. Of course I needed to feed these hungry kindergarten graduates so it was pizza, fruit, veggies, and junk food on the menu! These excited and energy filled boys loved busting into the start of summer break! They jumped right into the pool, sped down the slip n slide, and got right into a water gun war with their very own loaded squirt gun that awaited them at the water gun station aka the water table. After lots of free water play I suggested a game of Twister which the boys happily agreed too. But this wasn't just a normal game of Twister. I put color coordinated shaving cream on the circles to add a little messy fun. After Twister it was time for the classroom challenge. Each team of four competed in a sack race, tug of war, game of keeping the balloons in the air using only pool noodles, and an obstacle course. Unfortunately I didn't get pictures of it all because I was busy coordinating and playing too! When I say simple and affordable, I mean it. The pool noodles and balloons were from Dollar Tree and the kids had a blast trying to keep the balloons in the air using only their pool noodle. The obstacle course consisted of jumping through hoops, weaving through cones, throwing foam rockets into a hula hoop, kicking a soccer ball into the goal, and then finding a flag in the pool of shaving cream. Can you guess which was the kids' favorite part of the obstacle course?! 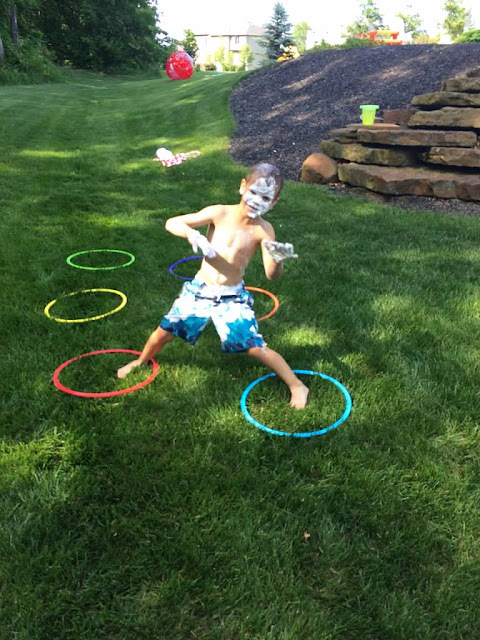 However, what kind of summer party would it be without water balloons?! 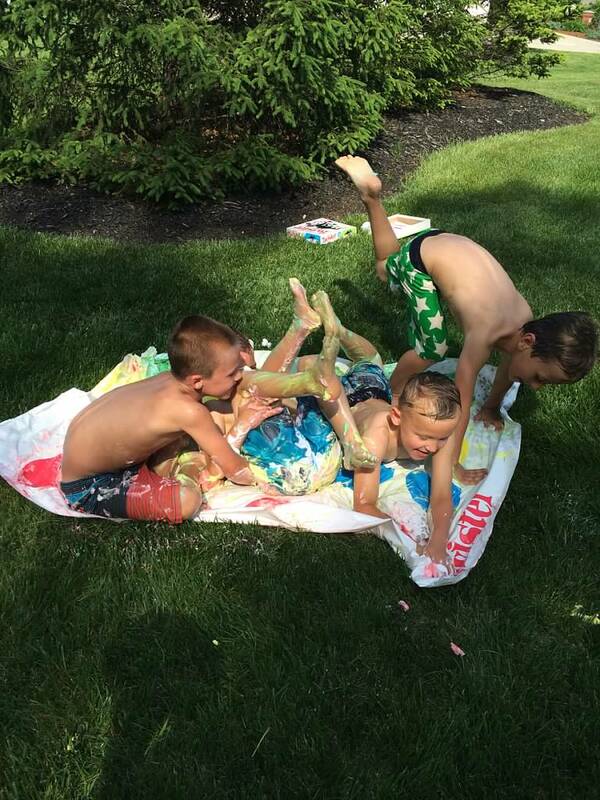 For the grand finale, I opened the large cooler full of water balloons and let the boys go at it! It was a great way to celebrate a wonderful school year and kick off to summer! 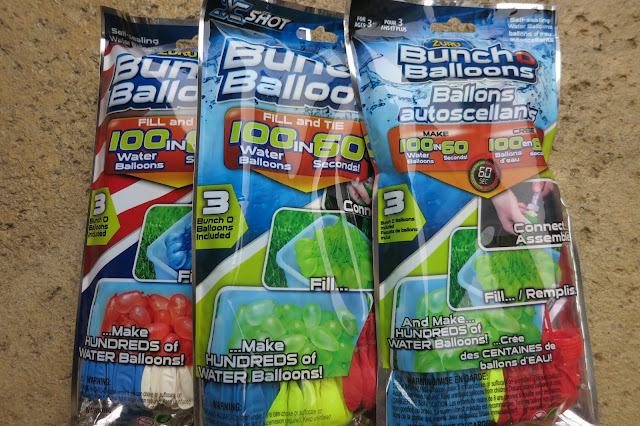 We love water balloons, so of course I've tried a few products that are supposed to make filling and tying them easier. When I filled the fifty balloons for this party I simply used the plastic nozzle attachment which helped but still took a lot of time. I even googled products last year and one of them promised to fill ten water balloons at once, without having to tie them! I loved it but at $30, no way! However, this year I found Bunch O Balloons (same concept) on sale for $8, normally retail at $10 for thirty balloons and they work! It literally takes sixty seconds to fill ten balloons and all you have to do is turn on the hose! I've stocked up and highly recommend this product! Attention all young Padawans!! 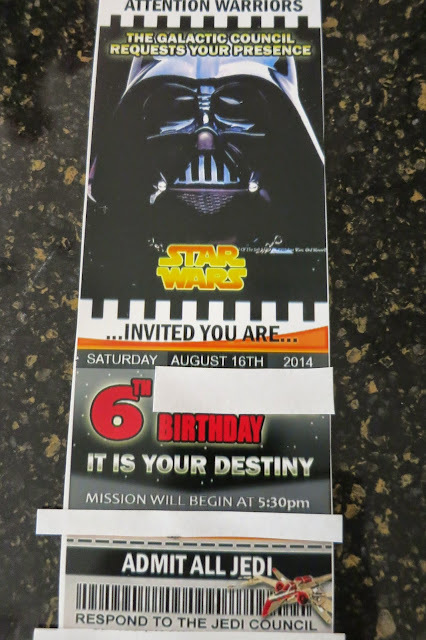 The galactic council requests your presence for the twin's 5th birthday. Be prepared to complete Jedi training camp, test your newly acquired skills on Lord Vader himself, experience an invasion of the empire, feast on "Princess Lays®", Palpatine's Pizza, and "Obi Wan Kanbob-ies", then take a seat outside by the fire for an outdoor showing of Star Wars! May the 5th year of life in the galaxy be with you! Before the latest episode of Star Wars was released at the end of 2015 my little guys were obsessed with all things Star Wars! It all began over Memorial Weekend 2013 when a convention similar to Comic Con took place at the resort we were visiting. Once the twins met Darth Vader and R2D2 they were hooked. Yes, they have dressed as Star Wars characters for the last three Halloweens! So when it was their turn to have a birthday party (every other year) it wasn't hard to think of a theme. By no means am I a Star Wars expert, but I do enjoy the movies and knew enough to create and execute a celebration that resembled the one which took place on the planet Endor after the rebel alliance destroyed the death star and killed the evil emperor. 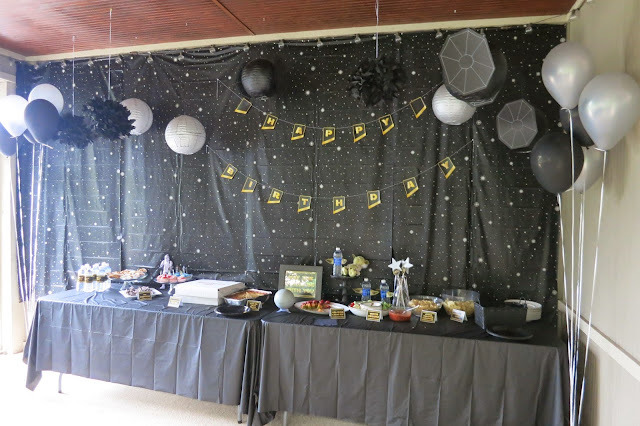 I am excited to share the details and pictures of our Star Wars Birthday Party, and one of the most fun parties I have ever planned. From the start I knew I wanted to have "real" Star Wars characters at the party and an outdoor movie showing of the original Star Wars. The "real" Star Wars characters who we have had the pleasure of taking pictures with at local hockey and baseball games on Star Wars nights are members of the 501st Legion. This is a group of volunteers that promote interest in Star Wars by wearing top quality costumes and attending Star Wars related events while also contributing to the community through charity and volunteer work. Private parties are not this group's priority but this crazy momma made it happen with a flood of emails, phone calls and a donation to the wonderful Make A Wish Foundation this organization supports. I had a back up plan if this didn't work out, but I was on a mission to make it happen! And I have to note, the members that took the time to come to our party were extremely professional, great with the kids, and truly made the party fantastic! Thank you 501st Legion! Since I was stepping my party planning up a notch this year, I wanted to get real paper invitations. After scouring the Internet for ideas, I was ecstatic to discover these Star Wars party invitation tickets on Ebay from UPA Designs. These were absolutely perfect for this party. I purchased and customized the file for about $10 and was able to print off as many as I needed at a local CVS. On the big day, the scene was set with the Star Wars soundtrack playing throughout the house. Once our party guests entered through the front door they were presented with their very own Jedi robe and light saber. The Jedi robes were simple to make. I bought the fabric from Walmart and literally just cut the length I wanted (using my kids to measure how long or short they needed to be) and a hole for their head. The yarn was also from Walmart that tied around their waist. The light sabers were made from pool noodles I purchased at Dollar Tree, cut in half and then taped with Duck tape and electrical tape for the grip. The parents helped the young Padawans get their robes on while I explained the tasks they needed to complete in order to achieve the coveted Jedi status. Once the boys were dressed we headed downstairs to complete the first mission, Save Princess Leia. In one of about two dozen balloons was a small Princess Leia, the Padawans needed to pop the balloons using the force, or any means necessary to save the princess. After a couple minutes they figured out that sitting on them was the quickest way to pop the balloons and save Princess Leia. Task number two: Destroy the Death Star. Each Padawan got three chances to shoot and bring down the Death Star with our handy blaster, aka Nerf gun. Task number three: Challenge Course. The Padawans had to make their way through the laser beams and retrieve their light saber before hopping over hot lava and scaling an enemy ship (our play loft) then fly down the emergency shoot (the slide). Don't fall in the hot lava! Stars and planets hung from the ceiling transforming the playroom into a Star Wars worthy scene. The fourth and final task was to defeat the one and only Darth Vader! When the Imperial March began blasting through the speakers, the young Padawans sensed what was happening, and instead of any fear these brave youngsters took on Darth Vader with a vengeance! Darth Vader was down on the ground in a matter of minutes and victory was theirs. A big thanks to Mr. Chris for playing the part of Darth Vader! Once these fearless youngsters were done celebrating they were each presented with an official certificate that pronounced them Jedi! 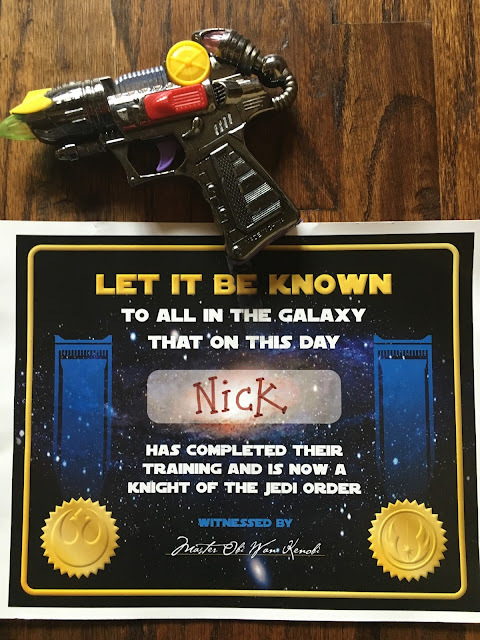 The certificates were part of the Star Wars Instant Download I purchased off of Etsy from Hello My Sweet. This package included the birthday banner, food and drink labels, gift bag tags, and a couple other Star Wars signs. After seeing what awaited them, most of the Jedi quickly retreated downstairs expect for this one! "It's okay guys come back up!" 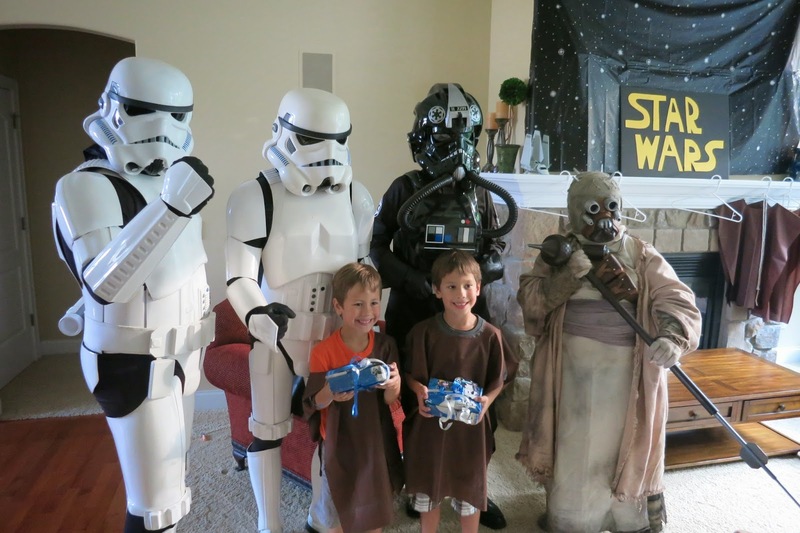 I have to say even I was a little taken a back by the presence of these stormtroopers, Tusken Raider, and Tie Fighter Pilot in our living room! Once the initial shock wore off and the young Jedi realized that these members of the empire were actually friendly and even came bearing gifts for the birthday boys lots of smiles and pictures were taken! It was now time to feed these now hungry Jedi. Palpatines Pizza, "Princess Lays®", "Obi-Wan Kabob-ies", Vader Veggies, Storm Trooper Scoopers, Tie-Fighters, Force Fuel, and Yoda Soda were all on the menu. I made the tie fighters with black paper lanterns, drew the wings with a white chalk marker and hot glued the wings on. After cupcakes and presents we put on the outdoor movie and let the Jedi run around and burn off some energy before returning home after an eventful evening under the stars. 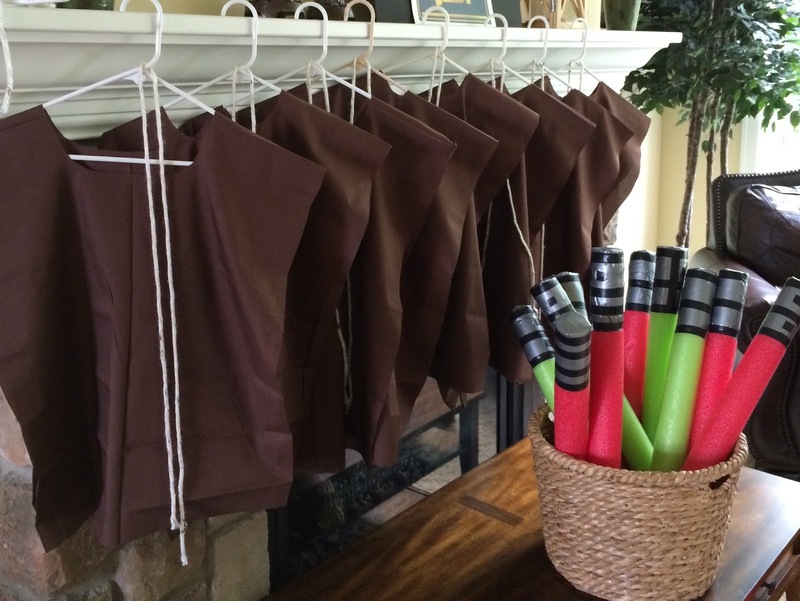 Each Jedi took home a party bag filled with a light saber sucker, laser gun, and Star Wars coloring book. This was certainly the most fun I have ever had planning and hosting a party, but the highlight of my night was both boys giving me a huge hug saying this was the best day ever and asking if we could do it again! When it comes to Christmas gifts, I'm always looking for a few educational gifts to throw in the mix of the coveted video games and Barbies. So I was thrilled to find Insect Lore's Live Butterfly Garden. The complete kit includes a voucher to redeem your live cup of caterpillars when you are ready to raise and release them for $19.99 on Amazon. However, I did see one on clearance at Toys R Us last season for $10! Because this was a Christmas gift, we set this aside and had something to look forward to come spring. In March, I ordered our live caterpillars and the kids and I had a discussion on the life cycle of the butterfly. I printed off a free butterfly life cycle poster I found on Pinterest for the girls so they had a visual. We then made butterflies out of coffee filters painted with watercolor and tied together using pipe cleaners. There are so many cute and crafty butterfly projects you can do with this lesson. Just look on Pinterest for more ideas. Our caterpillars arrived all ready to go. All we needed to do was set the cups out of direct sunlight and away from our curious cats! The fireplace mantle worked well for this. The caterpillars crawled around for about eight days. We had one caterpillar that was very late turning in a chrysalis and was the only one that did not survive. Once all the caterpillars turned into chrysalis' we transferred them (attached to the paper at the top of their cup) to the butterfly habitat. I pinned the paper to the side of the habitat and we waited. After about nine days in the chrysalis form our first two butterflies hatched! The rest hatched over the next two days. We put fresh watermelon, tangerines, and a paper towel soaked in sugar water for them to eat. After observing the butterflies for a few days and making sure it was warm enough (above 55 degrees) we took the butterflies outside and released them. This year we are working on making a butterfly garden, planting milkweed and other flowers that attract butterflies and hummingbirds. Pictures to come as the kids are in charge of this garden.